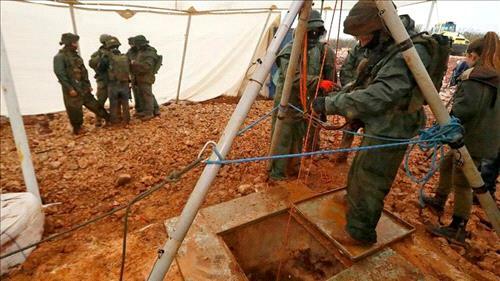 AMMONNEWS - Israel’s army said Wednesday it had located a fifth Hezbollah attack tunnel crossing into its territory from Lebanon and destroyed it with explosives. The military launched an operation earlier this month to locate and destroy tunnels from Lebanon that it said Hezbollah was planning to use in a future conflict against Israel. The army released a video of Wednesday’s activity. It shows an officer shouting across the border and warning residents of the Lebanese village of Ayta ash Shab that they are in danger and to stand far away. The video then shows a countdown before a soldier pushes a button, and aerial footage of a powerful explosion. The military said in a statement that the new tunnel had been dug from the Lebanese village of Ayta ash Shab. “This is another blatant violation of UN resolution 1701 and of Israeli sovereignty,” the statement said, referring to the resolution that ended a 2006 war between Israel and Hezbollah. Israeli Prime Minister Benjamin Netanyahu said Tuesday that the tunnel operation was nearly complete. The highly publicized Israeli operation to expose and destroy the cross-border tunnels has gone ahead without drawing a military response from Hezbollah.